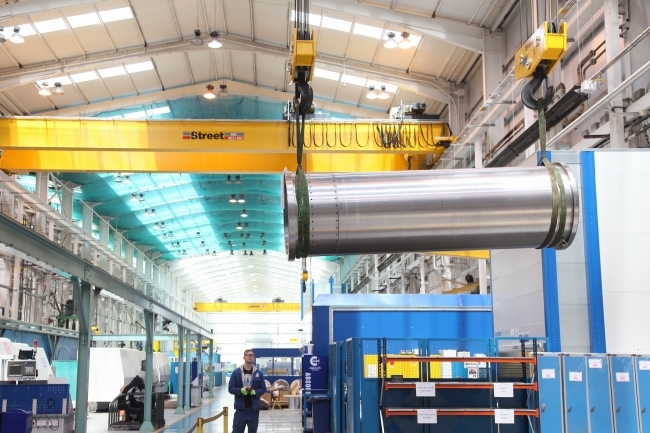 Street Crane has partnered with Hayward Tyler to supply and install six new overhead cranes for its newly extended production facility, which is one of the most advanced of its kind in the world. Hayward Tyler designs, engineers and manufactures specialist motors and pumps for the most demanding environments across the global energy sector. Following a £20m investment it has turned its Luton-based factory into a ‘Centre of Excellence’, including a 30,000 sq ft extension, which has more than doubled production capacity. 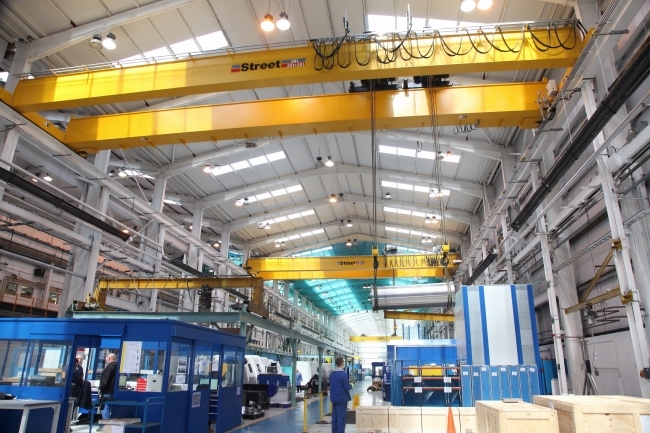 Street has supplied and installed two 40-tonne double girder cranes in the newly extended part of the facility and replaced cranes in the existing part of the building with two 40-tonne and two 25-tonne double girder cranes. All new cranes operate between the existing and new part of the factory. The new overhead lifting equipment is used throughout the entire manufacturing process, from unloading materials on arrival through to final equipment despatch. Larry Redmond, Special Projects Director for Hayward Tyler explained: “We view our assembly and test area as one big machine system and the cranes form a vital part of that machine, providing the appropriate lifting capability for the large motors and pumps we manufacture. The crane equipment is essential for all stages of the process including loading machines, as well as the assembly and testing of our products. The cranes feature heavy duty Street ZX hoists and have been designed to optimise space in the new part of the facility, providing a high top hook position to give the best lifting height. They are all operated by radio remote control equipment, which improves safety and ease of operation as it allows the operator to take the optimum position for viewing and controlling lifting. All cranes also feature an infrared anti-collision system to maximise crane safety. The ZX wire rope hoist technology reduces servicing times. An open plan hoist design allows swift and simple access to all key areas of the hoist transmission and structure for all maintenance procedures without any need for major dismantling work. Larry continued: “Street’s ability to work in partnership with us was key to the success of this project.The team worked closely with us throughout the design process to ensure the cranes would be fit for purpose and that there was minimal impact on production when the replacement cranes were installed in the existing part of the factory. Chris Lindley-Smith, Street’s sales director added: “This is a very impressive new facility which relies on safe, reliable and advanced lifting equipment to meet its demanding production schedule. We responded to the needs of Hayward Tyler with bespoke cranes that are smooth and easy to operate. “Crucially for the client, we were able to work with the wider design and build team to install the cranes with minimal disruption, ensuring they could be accommodated effectively in both the new and existing building structure.